XYZprinting has experienced quick growth over the last few years and has now become the largest 3D printer manufacturer in the world. Their reach covers more than a fifth of the global market for 3D printers. How did they grow so rapidly? By focusing on developing high quality, easy to use consumer and business printers at affordable prices. Their aim to become a one stop shop for all things 3D printed has definitely paid off. This year at CES 2018, XYZprinting showcased their new Da Vinci Color. This four color 3D printer comes complete with a four color scanner built right inside. At a price point of $4,000, this model is designed for small to medium businesses, as well as consumers who are professional makers/crafters. It prints with a color quality similar to your home ink jet printer and offers 16 million different color shades by using their new Color Inkjet PLA Filament. It comes with a gallery of files to get you printing right away, as well as with free entry-level 3D printing software that is designed to assist you with designing your own unique 3D prints. This new version of the da Vinci will be available in the second quarter of 2018 at their website and Amazon. 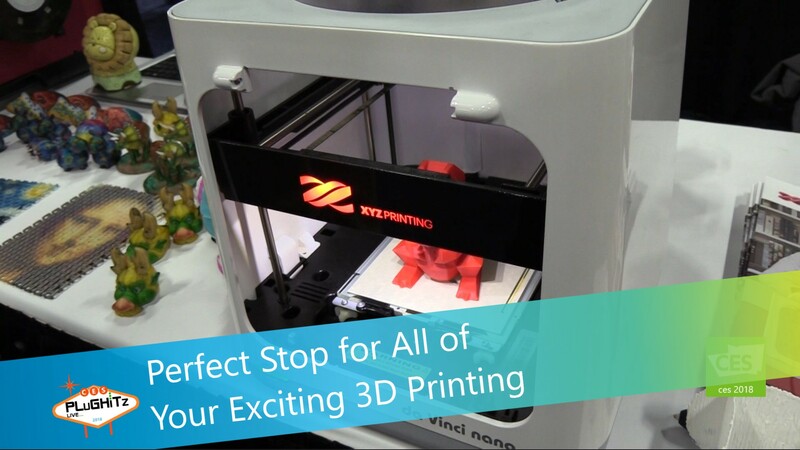 XYZprinting offers a full line of personal 3D printers, as well, with prices starting at $229. Check out some of the options currently available, some of which with reduced prices, at the links below.